The Football Association of Wales (FAW) is confident its bid to host Euro 2020 games in Cardiff will be successful. The tournament will be hosted across 13 cities and the FAW has applied for group-stages matches and a last-16 tie at the Millennium Stadium. European football's governing body Uefa said 19 countries had submitted bids to host games in the 24-team tournament. "I'm confident," said FAW chief executive Jonathan Ford. "We've got a strong bid, a winning bid." He added: "We can do it, we've got the track record of doing it and ultimately the legacy this would leave in this country would be far greater than any other." Uefa will announce the successful bids in September. Scotland and the Republic of Ireland have also applied to host group-stages matches and a last-16 tie, as well as England who are also in the running for the semi-finals and final with Germany. 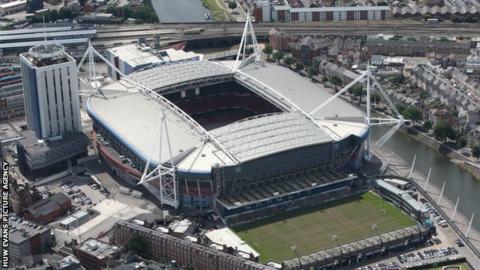 Ford said the Millennium Stadium was at the heart of the FAW's bid to stage matches. He said Wales had already shown it could successfully host major sporting events such as the FA Cup final, Rugby World Cup final and the 2010 Ryder Cup. "We've got a fantastic stadium. It's absolutely key to our bid... over 40% of the bid will actually be adjudged just on that stadium alone. "It's very important to demonstrate that the 'one team Wales' approach has worked in the past in the staging of major events. "We've been very successful whether that's the Ryder Cup, the Rugby World Cup or major football events as well. We're really hopeful that we can prove to Uefa that we've got a winning bid."